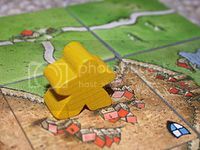 Carcassonne is a tile-based German-style board game for two to five players, designed by Klaus-Jürgen Wrede. This Tournament will follow on the rules in the basic game with a few changes to allow this tournament to work. You will play 15 1v1 Games on Route 66 once at least against each player. "Roads 1 point Per Win"
You will Play 3 of each Classic Cities maps: London, Istanbul, Jakarta, Moscow, Sydney. You will play at least each player once on one of these maps. "Cities 2 Points Per Win to the amount you think you can win, any amount after that is 1 point per win, if you do not finish your city you get 0 points." London Maps will have pennants and you will score double points here if you can manage to win them. "Instead of 2 Points you will gain 4"
"Fields 3 point for each city you connect too (each Win)"
"Cloister You score 1 for itself plus for each place higher, you will score additional tiles." You Win 9 Games of City Which you managed to win 2 of the London games (Bonus Pennant Points for the London Games). If this is higher than everybody elses, You win. If there is a tie, The player that won most games wins. If still somehow a tie, you will play a best of 3 in random city maps. "Please state when you say I'm In, The amount of City wins you wish to go after. There is 17 games to be played on this round. You may change this at anytime before Round 2 starts by pm'ing me." As this is an in depth tournament, feel free to ask any questions via here or pm, i will be more than willing to help and update this post if needed to clarify. Last edited by drake_259 on Sat Apr 26, 2014 3:13 am, edited 29 times in total. I'll try it out. but unclear about round 2.. looks like 20 games, but how many players in each game ? How do i score on round 2? You will play 20 games in total, of that 20 games you must tell me how many you think you can achieve a win. It is best to go lower than that you think as you will score 0 points for this round if you don't, but however if you do manage to reach the amount you stated you will score 2 point for every win achieved to the number you stated. After you have achieved your goal you will score 1 point for every win. Also The 1st 3 games you play in this round are bonus games which you score extra double points. For each of the 1st 3 games you win you will score 4 points instead of 2. Last edited by drake_259 on Fri May 02, 2014 5:22 am, edited 22 times in total. Last edited by drake_259 on Fri May 09, 2014 5:09 am, edited 2 times in total. Feudal War can only have up to 6 players play on it. You're going to have to update that before I can add the tournament to the database. Please state the number of wins you think you can achieve for cities? Last edited by TheQuietOne on Wed Mar 19, 2014 1:52 am, edited 1 time in total. ok, put me down for 6 wins. Again i cannot place you in unless you state how many wins your after in round 2.
put me down for 10 wins on round 2! Carcasonne! Man this is a great idea. You rock dude! In btw.